I’m working on a lovely book of inspirational verse and color photographs, and in order to proof the book and get some Advance Reader Copies, I’m using Blurb.com, who specializes in color books just like this. I’ve seen books from Blurb before, and they look quite good considering they are digital. They can’t compare directly with offset-printed photography books. But in truth, many offset printed books aren’t that good either. We tend to look at the best examples when doing comparisons. But the Blurb books were fine. Blurb calls them “bookstore quality books” and I think they’re not far off. Part of the reason I wanted to send a book to Blurb was to see the latest printing quality, because the digital printing world changes pretty quickly. I quite liked the Blurb website, which shows a lot of attention to accommodating the needs of users at both ends of the spectrum—people who just want to get a photo book for their own use, and professionals using Blurb as an engine for high-priced photo books. More on that later. There’s a neat rotating graphic on the website, by the way, that effectively sells Blurb’s product: individual people holding up an open copy of the book they have presumably made at Blurb. Nice touch. I headed to the “PDF to Book” page and found a list of links for getting more specific information. Many users will download Blurb’s proprietary Book Smart software, an easy-to-use book creation tool. Like other POD suppliers or digital printers, Blurb will provide you with all the information you need to properly set up, export, and upload files for both the interior and cover or jacket of your book. However, this is not for the faint of heart. The information is in a variety of locations, some within the “PDF to Book Publishing Guides” and cover InDesign templates, spine width calculations, “Introduction to PDF to Book Workflow,” “Six Easy Steps to Create a Book using PDF to Book Workflow,” and “Using Adobe® InDesign® to Make a Book” as well as training videos, FAQs and other support material. I think if I hadn’t done this for years, I would be pretty intimidated by the whole process, even though Blurb has tried to make it fairly efficient. For repeat users, the interface workflow is quite quick and easy. Blurb supplies lots of file support via downloads, and I strongly recommend anyone planning to go this route with Blurb to get the proper templates before you start to lay out your book. When it comes time to upload your files when your book is ready, they will reject books that are sized incorrectly to their bleed requirements. Using their templates is a way to ensure you’ve got everything in the right place. This is even more true for jackets. You can save a lot of layout time but just opening their premade jacket template with the front and back covers, spine, and flaps all laid out perfectly and with trim, bleed and “safety” margins ruled out on a separate InDesign layer. You can turn the guides on and off, a nice touch. If your images are Adobe RGB, ProPhoto RGB, Colormatch RGB, or another RGB color space, the optimal workflow is to convert your images to the CMYK profile optimized for the HP Indigo presses that Blurb uses. This ICC profile – HP5000SemimatteExp05.icc – can be downloaded at http://blurb.com/downloads/HP5000SemimatteExp05.icc. Color conversion is best done via an imaging program, such as Adobe® Photoshop®,prior to placing your images or graphics into Adobe® InDesign® or your preferred layout tool. I checked and double-checked, and everything looked good to go. My client had signed off, so I logged in and used the simple file uploader to send the jacket file and the interior bookblock file separately in response to prompts from Blurb’s upload interface. This puts you into their own ftp program but it’s invisible to the user. Having passed all the test, the book, Blurb announced, was now available for order. Pretty neat! And here’s where the reality of doing books with Blurb hits home: the price of your finished book. In a quantity of one, this 10″ x 8″, 96-page hardcover with a jacket would cost $44.95 to manufacture on the 100-pound premium paper Blurb offers. Plus shipping. It could easily cost $50.00 by the time it arrives. At what price do you think you can sell a small photography book and make a profit? Would you pay $60, $75, or $90 for a book of photos and verse? In fact, the only people I’ve heard about using Blurb commercially are professional photographers, who print books with Blurb exactly because they are not in the book business, their income is from selling their original prints. The books become like resumes, or catalogs, or bodies of work that can bring the work to the notice of collectors. I can’t wait to see the sample book from Blurb, and will be curious about the quality, paper stock, binding and jacketing, and how they compare to traditional offset printing. Stay tuned. Takeaway: Blurb.com offers an efficient and sophisticated gateway to their services, which split between amateur photo books and professional-level support. Expect good-looking books, but at a super-premium price. I would appreciate it if you could give your input on Blurb 2016. With there new distribution line and partnership with Ingram. I know when they first started it wasn’t worthwhile for publishers. But I can’t seem to figure if it’s gotten any better. Thanks for all your hard work. Never mind, I’ve found your update article. Thanks again. I know this was a few years ago but is there a follow-up article once you received this particular book from Blurb.com? Hi Andrew. No, I didn’t write a follow up, but the book was lovely. Wondering what recommendations you might have for self-publishing fully-illustrated children’s books? Is the quality at CreateSpace and Lulu, etc. subpar? I have authored several children’s books with Big 6 publishers but am looking to go it alone with a small cadre of like-minded authors & illustrators and photographers. We are concerned about the aesthetic quality of the finished product. Is there a Budget Blurb somewhere? Cat, good question. Digital color, while available at good quality from Blurb, has a long way to go to get to a reasonable price for publishers. Although I haven’t seen the color books from CreateSpace, it’s a very inexpensive test to upload your book there and see what the final product looks like. I would also request some copies of similar books from Lightning Source for comparison, since their prices will be similar to CreateSpace. I don’t think Lulu’s pricing model will work for you. Let me know what happens! We’re looking into doing a colorbook…lots of baby photos, food, some recipes, so we want a largish, squarish book. I’ve been trying to figure out what size to make it. Many companies say it should be “industry standard” but CreateSpace has different sizes than LightningSource, and different than other printers. How important is the size? Do distributors not accept certain sizes? We wanted to do 8.25 x 9.25 (measured a book we like) but don’t see that size anywhere. Thinking we should probably do 8.5 x 8.5 but not sure if this is acceptable. I’m new at book printing, as you can tell! Unless you pick a size that’s unweildy, you can do any size you like, but you’ll have problems with Blurb or Lightning Source because 1) they have a very limited range of sizes and 2) your books will be too expensive to retail through normal channels. These books are best done through offset printing, but then you have to put up several thousand dollars and deal with inventory. There just isn’t a great solution for color books right now, but I’m hoping technology will eventually provide more options. Julia, thanks for your comment, and go ahead and link, I appreciate it. I’m looking forward to seeing this book from Blurb. Since it will be printed by offset for the production print run, I’ll have a head-to-head comparison to report on. Thanks for the great review of this companies program. I have seen their site and wondered how user friendly it would be. It is a great alternative for someone that wants to have a book without going to the expense of hiring an editor and designer. 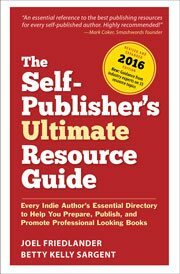 I am compiling a list of publishing resources and I would love to link to your review.